Yet, God calls us to “practice hospitality” (Romans 12:13) – even if we aren’t Martha Stewart. As we look at those gathered at the table for the first Thanksgiving, we see a powerful example of Christian hospitality. From this first celebration, we can draw several principles to help us put the practice of hospitality into the proper perspective and once again open our hearts and homes to others. Don’t get so caught up with preparations that you lose sight of the blessing. What would you do if 90 extra people showed up at your home for dinner? That’s exactly what happened to the Pilgrims on the first Thanksgiving. They had invited the an Indian chief and a few friends from a nearby tribe to join their celebration – and the chief – obviously thinking “the more the merrier” — brought 90 braves with him! Granted, the Indians did bring along five dead deer and a bunch of wild turkeys – but I can just guess who ended up with the job of dressing and cooking them while the men enjoyed the 17th century’s equivalent to football. So, did the Pilgrims panic? Perhaps just a bit… But the bottom line is they welcomed their guests with open arms, threw a few more pumpkins in the pot – and announced that dinner might be a little later than they had anticipated. No wonder the first Thanksgiving lasted three days! What can we learn from our industrious forefathers about the practice of hospitality? This year, I’m going to relish the unexpected and trust God to take care of the details! A simpler celebration is often more hospitable. Now that the Pilgrims had a real harvest, they had the chance to show the “natives” a real English feast. Instead, these gracious hosts welcomed the contributions of their guests to the dinner and shared recipes. The Pilgrims taught the Indian women how to make pies from the fruit they had dried during the summer months– and the colonists learned how to prepare Indian hoecakes with maple syrup. Yum! What does this have to do with us today? After all, none of your guests know have probably even heard of a hoecake! As we practice hospitality, it’s important to examine our motives for trying to put on a five course dinner – or insisting that the house passes the white glove test. God usually accomplishes the extraordinary through the ordinary. The offer of a warm meal or place to sleep may seem like a simple act of kindness. But God often uses a simple gift of hospitality to reap blessings for years to come. This is no more clearly illustrated than in a story told to me by my friend Floy. “My great-grandparents, who were homesteaders in Nebraska during the late 1800’s, encountered a snowstorm as they traveled by covered wagon from their home in eastern Iowa. Near evening, they sought shelter in a grove of trees. A nearby settler noticed them and welcomed them into his home. The next evening, as they reached their homestead, a neighbor welcomed them with warm hospitality. The generous hospitality impressed my great-grandparents so much that they vowed to be quick to help anyone in need. Their opportunity came about six months later when my great-grandmother woke-up on a cold morning to the sound of a baby crying. When my great-grandfather investigated, he found an Indian family who had taken shelter not far from the house. My grandmother quickly made up a big pot of cornmeal mush and invited the family indoors. Although they declined to come inside the house, my great-grandfather helped them build a fire and delivered the food to them – as well as other staples to sustain them as they continued on their way. What a beautiful example of the blessings of hospitality! Use your home to bring glory to God – and not yourself. The Pilgrims were extremely humble people – grateful to God for all they had – and even what they didn’t have. With this in mind, I have a challenge for you. As you open the door to your home this Thanksgiving…don’t worry if your guests won’t smell the aroma of a perfectly roasted bird – or notice your beautifully decorated home with not a cobweb in sight – or be greeted by your well-scrubbed, impeccably mannered children. This year, pray with me that our guests will see in our clear eyes – and relaxed smile – the beautiful, tender love of Jesus Christ! 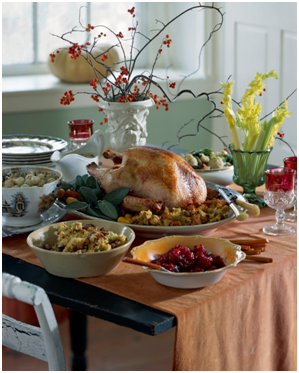 BTW — I am offer a FREE downlaod at my website that tells some little known the history of Thanksgiving and offers tips for simplifying your holiday. Just visit www.cyndysalzmann.com and click on FREE STUFF. You are currently browsing the CYNDY SALZMANN blog archives for November, 2008.